Central Vermont Medical Center's MyHealth Online are portals that allow patients to access their personal health record as well as test results and other information from where ever you have access to the intranet. Central Vermont Medical Center's Patient Portals are online tools that help you to manage your healthcare easily and securely, allowing you to view your personal health record whenever and where ever you have access to the intranet. CVMC has two separate patient portals that you can access depending on whether you are using our Hospital services or one of our Medical Group Practices. You must sign up for each portal separately in order to use both. We understand that your time is valuable. Our Patient Portals make time-consuming tasks simple... a few clicks, and you’re done! Please print and fill out the relevant forms below and return to Medical Records. To sign up for the Medical Group Practice Portal, please call or visit your practice location. Click here to find contact information for your practice. 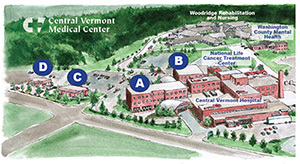 All of the information in the Portal comes from your Central Vermont Medical Center Electronic Health Record. This ensures that you have access to the most accurate, up-to-date information possible. If I already signed up for a portal to access information from a CVMC Medical Group Practice provider, do I have to sign up again to access information from my hospital stay? Or vice versa? Yes. These are two different sets of records so you do need to sign up for each separately. To log into the Portal, use the Patient Portal link listed above for the portal you need to login to. Then, simply enter your user name and password (see enrollment information in the "How to Sign Up" section above). Hospital Portal: Please use the contact us section on portal.